The Dutch baby is a favorite of mine because if you have your basic pantry and fridge staples, then you have the goods to make a baby. It is also a favorite of mine because the DB needs no real invitation to the table – baby is always in the right place whether it is on your plate at breakfast, lunch or after dinner. It is a dish that serves well as a vehicle for ridding yourself of extra fruits you have laying around that you need to find a quick use for, thus cutting down on food waste. 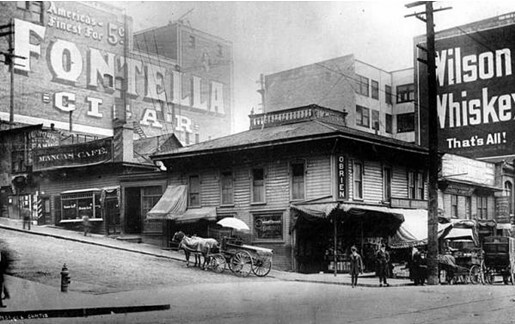 Manca’s Cafe, to the left, located in downtown Seattle, 1902. From the University of Washington Libraries digital collection. Make sure your skillet completely preheats in the oven (use an oven thermometer!). Hearing the sizzle of the batter as you pour it into the skillet means that it’s quickly setting and means the moisture can only move upward to escape. Aerate your batter well. This is more difficult when hand mixing. I typically hold my ingredients until just before the oven is completely preheated (again, use an oven thermometer!) and then aerate them well with a whisk, or if you have a food processor or blender, blend it just before you’re going to pour it, until the batter is nice and frothy. Keep the oven closed! We want heat as it is preheating, yes, but we don’t want to lose heat throughout the latter part of the cooking process because we’re opening the oven to check every 5 minutes. Only check on your baby after 15 minutes of cooking, and be quick with it. Traditionally, a benchmark batter uses a third of a cup of flour and a third of a cup of milk per egg, although that isn’t quite what I do below. Toppings aside, what is fun about this pancake are the additions to the batter you can make to your own taste. I often cut back on the sugar and use no cinnamon, but I enjoy vanilla and nutmeg. Have fun with this one and make it your own! Preheat oven to 400F with skillet placed inside. If using a food processor, place flour, sugar and salt into processor and aerate them by pulsing a few times. If using a whisk, thoroughly mix until well incorporated. Add remaining ingredients and blend or mix until a smooth, frothy texture is achieved. Remove skillet from oven and add your 1 tbsp of reserved butter to pan and coat evenly. Pour batter in, expecting some light sizzling. Place skillet and batter in oven for 15 minutes. The pancake should puff up towards the end of its cook time. When removed, top with fruits, powdered sugar, syrup, or a squeeze of lemon or any desired combination. Note: I prefer a less sweet pancake. If you like your sweets more than I, increase the amount of sugar and experiment.